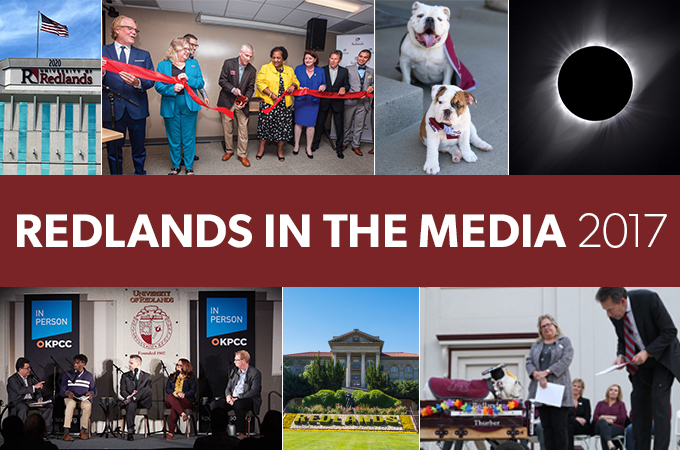 Mascots, machines, and the moon’s dance with the sun were just some of the topics making headlines and claiming media and social media space for the University of Redlands in 2017. A little bulldog with a big personality captured our hearts and made history in 2017. Adelaide, a.k.a. Addie, (she shares a name with the U of R’s founding first lady Adelaide Field) made her debut as the University’s first female live bulldog mascot. As mascot-in-training apprenticing with sitting mascot Thurber, our little pup Addie became big news on NBC News Channel 4. She was featured on the news broadcast, the website, and created quite the buzz on social media, where a video posted to Facebook of Addie and Thurber received more than 91,000 views. The pups’ tale took a sad turn in November when the University community learned that 8-year-old Thurber, who had served as U of R’s beloved mascot since 2010, had been diagnosed with cancer. Understanding Thurber was unlikely to make it to the planned April 2018 graduation and retirement, students initiated a plan to honor him that week. Thurber’s graduation ceremony, where he received honorary degrees from President Ralph Kuncl and Provost Kathy Ogren in front of more than 200 guests, not only made local news in the Redlands Daily Facts and Fox 11, but also national and international news in The Miami Herald, Sacramento Bee, Idaho Statesman, The Dodo, and other outlets. The item was also popular on social media, with the video of Thurber’s graduation posted on Facebook drawing more than 12,000 views and an Instagram photo paying tribute to Thurber garnering more than 7,900 impressions. 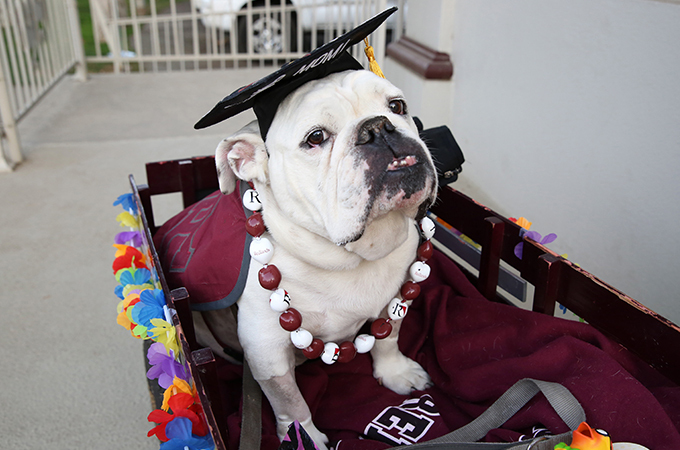 On the day following his commencement, Thurber passed away, crossing the rainbow bridge as a proud alumnus and Bulldog for life. His obituary appeared in the Redlands Daily Facts and the Press-Enterprise. “Are we worried about this from a social perspective? Not for tomorrow, but for 10 years from now? It’s quite frankly frightening,” says Johannes Moenius, director of the Institute for Spatial Economic Analysis at the U of R.
You don’t have to be a robophobe or a technophobe to be alarmed about robots coming after our jobs. 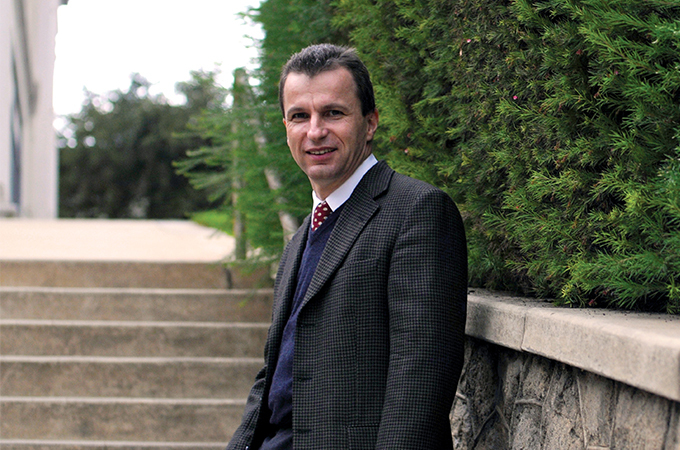 In the future, robots taking over could be a reality, according to research conducted by U of R’s Johannes Moenius, director for the Institute of Spatial Economic Analysis, showing a significant number of jobs could be lost to automation, and that some cities and demographics are more susceptible than others. That ominous news made headlines nationally in the Las Vegas Review Journal and on Nevada Public Radio and online internationally on Marketwatch.com and FastCompany.com among other sites. The most vulnerable population to this trend, according to Moenius? Those without an education. 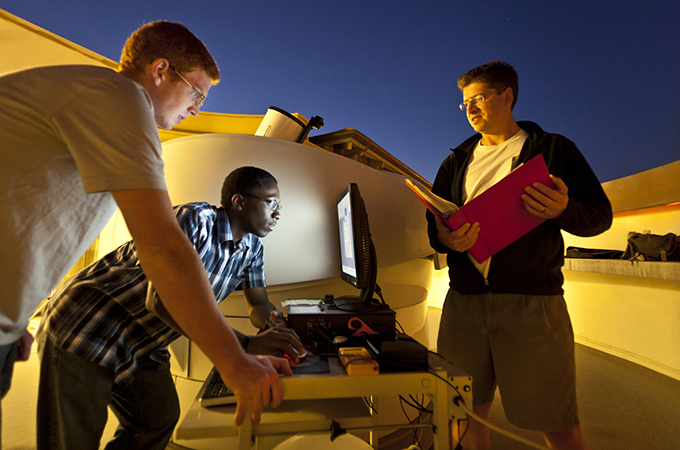 U of R professor and physicist Tyler Nordgen (right) spent much of 2017 encouraging would-be viewers of the August 21 total eclipse to put down their phones and cameras to fully experience the moment. Mission accomplished for U of R professor and physicist Tyler Nordgen who spent much of 2017 encouraging would-be viewers of the August 21 total eclipse—whether at a location along the 12-state path of totality or in large regions of the continent where a partial eclipse could be seen—to prepare to put down their phones and cameras and fully experience the moment. If you don’t think U of R when you think San Diego, think again. The opening of our new regional campus serving working professionals, active military, and veterans drew the attention of the Times of San Diego and KUSI News, which both reported on the expanded presence of Redlands in San Diego. United Technologies Corporation (UTC) has expanded educational opportunities for its global workforce through a new collaboration with U of R opening the door for UTC employees nationwide to pursue undergraduate and graduate degrees offered through the U of R School of Business, including the online MBA program. 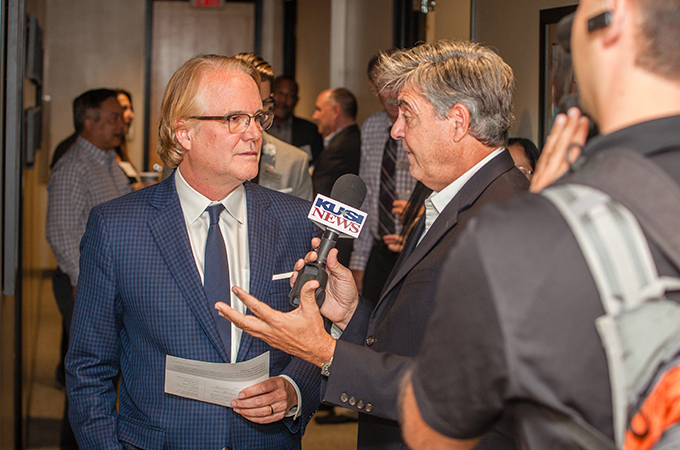 Southern California Public Radio held two live events on the U of R campus in 2017, raising important issues and encouraging important conversations. KPCC’s “Take Two” host A Martinez moderated the discussion “The system is broken: California, immigration and President Trump's policies” in February. The panel included U of R’s Steve Wuhs, assistant provost for internationalization; San Bernardino Police Chief and U of R alumnus Jarrod Burguan; and U of R student Xiadani, who was facing the consequences of changes in immigration policy. 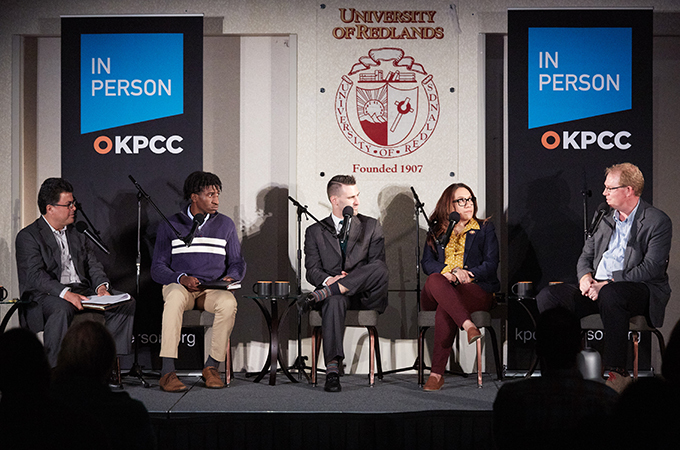 In November, KPCC “In Person” personality Adolfo Guzman Lopez hosted a panel discussion on “Free speech vs. hate speech on college campuses.” The panel included Dr. Andrew Wall, dean of the School of Education, and Kamal Bilal, U of R student and president of the Associated Students of the University of Redlands (ASUR). Also participating from the audience were Provost Kathy Ogren, General Counsel Brent Geraty, and Dean for Student Affairs Donna Eddleman. The discussion was live-streamed on Facebook and the KPCC website, and covered in the Redlands Daily Facts. With all these happenings to help draw an audience, the University’s social media presence grew across the board in 2017. Followers of U of R’s main Facebook page grew from 15,600 to 21,721, up 39 percent. The number of the University’s Instagram followers moved from 3,837 to 5,356, an increase of 40 percent. U of R Twitter followers went from 4,188 to 5,036, up 20 percent—but even more remarkably, as the University became more active on this channel the number of impressions increased nearly tenfold year over year—from 561,000 to 5.4 million. The University was also well represented on Linkedin, Pinterest, and YouTube. The year also contained some innovations in the social media space. Making their debut were the Bulldog Blog, covering news and views from the U of R; an online directory of some of the most prominent U of R social media channels (including the mascot, alumni and friends, and Bulldog athletics); and a Snapchat channel, @urbulldogs, to reach a younger demographic, including prospective students. We welcome your comments, suggestions, and contributions for social media at social@redlands.edu.